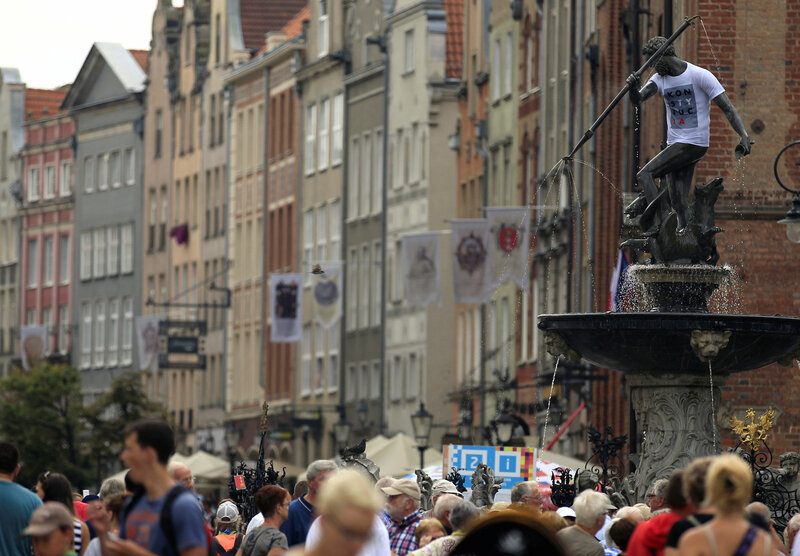 Locals and tourists in the northern Polish city were greeted on Friday morning by the strange sight of the trident-wielding deity in a fresh white T-shirt above his uncovered bronze legs. Four other city landmarks, including statues of a Polish king and a group of World War Two heroes, received similar treatment overnight – the latest targets of activists who have struck across the country in the past two weeks. The protesters are fighting a judicial overhaul by the ruling Law and Justice party that led to President Andrzej Duda’s approval in July of a measure effectively letting the government choose the next Supreme Court chief. The government says the changes are needed to make Polish courts more efficient and rid them of the vestiges of communism, but its critics say they undermine the independence of the courts. The reforms have sparked massive protests in Poland and put Warsaw on a collision course with the European Union. KOD, the group behind the T-shirt campaign and other protests, said the action was “an attempt to draw the attention of broad public opinion to the fact that the president, despite many protests, signed a bill which changes the Supreme Court into a mock-up”. 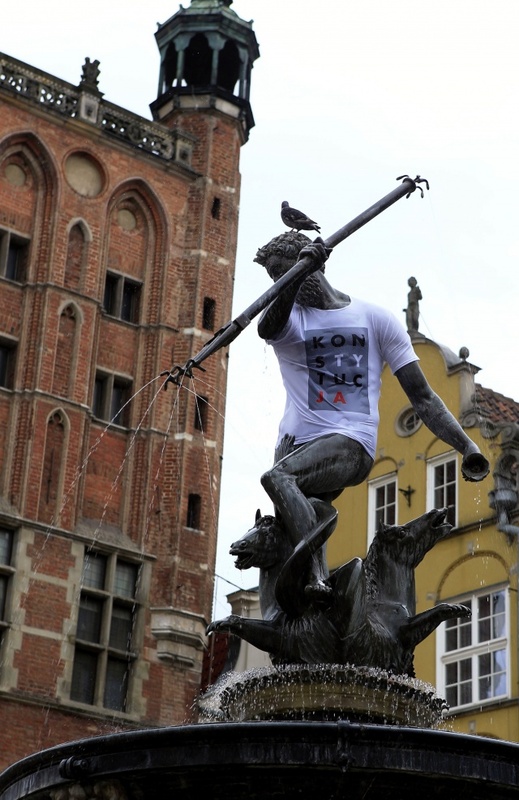 Elsewhere, the T-shirt activists have dressed up the Wawel Dragon statue in Krakow and the Floppy-Ear Teddy in Lodz, among many others. In the eastern city of Biala Podlaska, two KOD members were charged with profanation after draping the T-shirt on a statue of the late Lech Kaczynski, Poland’s former president who died in a plane crash in 2010 and whose twin brother Jaroslaw is the head of Law and Justice (PiS) and Poland‘s de facto leader. “This is extremely ill-mannered and inappropriate. 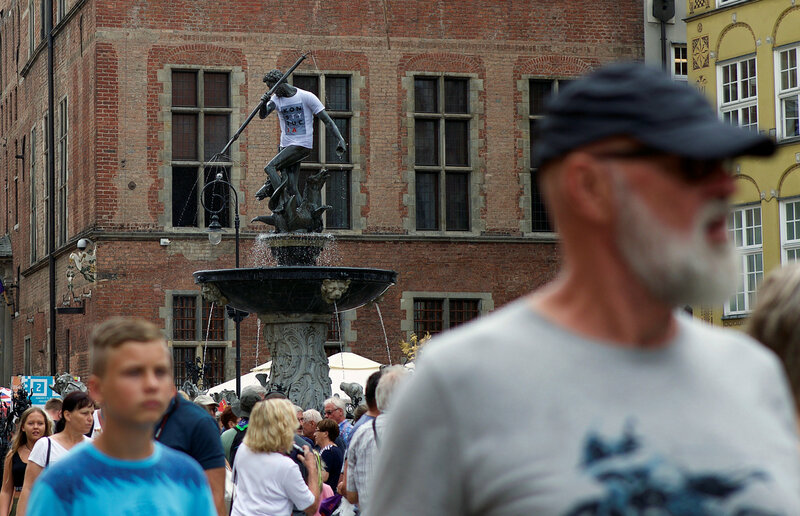 This shows the helplessness of the protesters who have no other idea how to attract attention,” Tadeusz Cymanski, deputy head of the PiS parliamentary caucus, said of the T-shirt campaign.